“I am so thankful for the trust, confidence and support given to me by my ASP family” the words said by Ms. Mary Janette Peña after she was elected as the new ASP National President last May 12, 2012 at Kamay Kainan, Kalayaan, Quezon City. The election followed after a sumptuous thanksgiving lunch to honor and thank the outgoing Trustees for their valuable contributions to ASP. It was also an opportunity to welcome the incoming Officers and Trustees. ASP Chair Emeritus, Dang Koe, gave a short presentation on the history and accomplishments of ASP. She also briefed the new Trustees of their primary duties and responsibilities, before the election of officers. "I was no longer afraid to move, because I already saw the models to emulate to be a good ASP Leader. Wala akong alam, but because you are there, marami akong nalalaman. Wala akong lakas, but because Cavite is behind me, kaya ako may kalakasan. Wala akong power, but because God is in me, I can do all things through Christ who strengthens me..." part of the text message that Ms. Peña sent to me in the morning of May 14, 2012. Peng So, Beth Udquin and Nato Agbayani. (Seated) Evelyn Go, Cecile Sicam, Jan Peña and Mona Veluz. Not in the picture are Carmel Almendrala, Alex Cabason and Gina Bermudo. The election of the Board of Trustees was held last April 28, 2012 during its General Assembly at Crowne Plaza Galleria Manila, Quezon City. The winners of the election were announced the following day or Day 2 of the 12th National Conference "Hope@Home" witnessed by more than 400 delegates from around the country and by the members of the ASEAN Autism Network coming from Brunei and Thailand. Congratulations and more power to our New Board of Trustees! A Strategic Planning Workshop is scheduled on May 26 and 27, 2012 to be hosted by Bridges Foundation to set ASP’s strategic direction for 2012 to 2014. 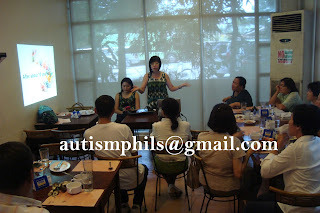 Induction of the new Board of Trustees is scheduled during the Echo of the 12th National Conference on Autism in time for the celebration of the National Disability Prevention and Rehabilitation (NDPR) Week this coming July in Cavite. Thank you to the BOT 2009-2012 and congratulations, best wishes to the new BOT 2012-2014. We will be here to support the new leadership. May God always keep us in His loving arms!